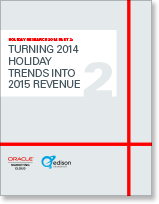 Oracle Marketing Cloud | Holiday marketing planning for 2015? Then you definitely want to see this. Your best holiday season ever. Forget about reindeer games, this is serious business. That’s why we partnered with Edison Research in 2014 on a groundbreaking study where we learned not only what consumers said they would do but also what they actually did regarding their holiday spending and the behavior behind their decisions. We then applied those findings, added in some specific ways to learn from past behavior and spending habits – and put it all together in one gift-wrapped eBook entitled Turning 2014's Holiday Trends into 2015 Revenue. Oracle Marketing Cloud is your single source of award-winning solutions for cross-channel, content, and social marketing with digital advertising management and the big data you need to run it all. Copyright © 2015 Oracle and/or its affiliates. All rights reserved.